There was a feeling this time 12 months ago that Tyrone had the team and the system to give Dublin trouble. Coming into their All-Ireland semi-final they had ticked a lot of boxes, including retaining their Ulster title, winning a big game at Croke Park and smothering pretty much every attack they met. Yet it proved to be a mirage and it was cruelly exposed three minutes in when Young Footballer of the Year-elect Con O’Callaghan scored Dublin’s first goal of the day on the way to a 12-point win. 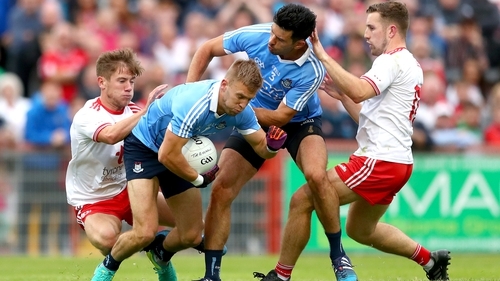 This year, there’s no one making a compelling case for Tyrone as they get ready to take on Dublin in their first All-Ireland final appearance in ten years. That, in itself, is interesting. Do they have better footballers and a stronger bench than Tyrone? It certainly seems so. The last time the Boys in Blue were such overwhelming favourites at this stage of the season was 1992 when the had the open top bus organised weeks in advance. They took the bus journey down O’Connell Street right enough, but Sam Maguire was up in Donegal. Favouritism is often something teams in the GAA shy away from and it doesn’t sit easily on many shoulders in hurling and football. Are Dublin being so heavily tipped and backed that it will lead to complacency? This would appear to be Tyrone’s best bet because man-for-man they haven’t shown anything like enough so far to suggest they can upset the four in-a-row chasing All-Ireland champions. How many men with Red Hand crests on their chest would be good enough to depose any of the players in a blue jersey? Three, maybe four at a push. Last year’s defeat prompted a rethink from Tyrone boss Mickey Harte and in 2018 his team are playing to a more expansive game plan. No doubt, safety first is still the key when they don’t have the ball, but they have willing and capable runners to hurt teams on the break when they turn possession over. Twelve months ago the template was to sit deep and frustrate Dublin, only they were picked apart by patient, clever attacking play and once they fell behind - after just three minutes, remember - they had no idea how to chase the game. This Dubs team has the feeling of Brian Cody Kilkenny in their pomp, 2007 and 2008, when they were winning two and three on the way to their own four in-a-row, ripping teams apart and putting finals to sleep early as expected. Dublin are comfortable with the level of expectation surrounding them and they generally play up to it. How often have they failed to perform under Jim Gavin? Probably just in the 2016 drawn All-Ireland final with Mayo, when they needed the benefit of two first-half own-goals to keep them in the game. Even in the 2014 All-Ireland semi-final defat to Donegal, Gavin’s sole reverse in Championship football since taking over in 2013, they played as well as expected. It’s just that they were rumbled tactically and that hasn’t happened since either. There are various theories about how to beat them; you need a sweeper, you have to go man-for-man… The closest anyone has come to beating them is Mayo, with two draws and two one-point defeats in recent Championship encounters. That was achieved largely by going man-to-man, but allied with an eye-popping intensity and want that no other team has come matched during this time. Dublin won because they had better footballers to start and a stronger bench. There are only two dogs in this fight and both of them have a chance of winning, even if one of them has a far smaller chance than an other. No one is writing Tyrone out of the script here. To see Mattie Donelly lift Sam Maguire though would require a major upset. An awful lot would have to go right for them while at the same time the house comes crashing in down on Dublin, with big players going missing and game plans breaking down. The thing about this Gavin 3.0 team is that they are more risk averse than their previous iterations; the ball is kept out of contact, shots aren’t taken unless they’re on and the door remains locked at the back with Cian O’Sullivan as sweeper, though doubts do remain about his fitness following his hamstring injury in the slow strangulation of Galway in the semi-final. It’s death by a thousand cuts for opponents, points picked off from in front of the goals, inside 30 metres. It’s not flashy, but it’s oh-so effective. Tyrone are going to have to shackle quarterback Ciarán Kilkenny, probably a job for Padraig Hampsey, and work diligently to track runners from deep off the ball. They’re going to have to squeeze Stephen Cluxton’s kick-outs and compete ferociously around the middle third. It's certainly something they managed for stretches in the Super 8s meeting in Omagh, on a shrunken pitch that afforded the visitors a lot less room than they'll have this weekend. They’re going to have to take the game in quarters - make sure they’re not sunk by an early blitz, that they’re still in it at half-time and that they’re not turned over after the break. They’ll have a chance if they can push the Dubs down the stretch, testing resources that are thinner this year with Bernard Brogan unlikely to feature and Diarmuid Connolly not part of the panel. Harte will also have to come up with something different and that’s certainly not beyond one of Gaelic football’s great coaches and innovators. That’s all a long way of saying Tyrone have a chance, though not a huge one. Dublin are justifiable favourites and expect them to live up to that tag. Follow the All-Ireland senior football final via our live blog on RTÉ.ie and the News Now App, watch television coverage on The Sunday Game Live from 2.30pm on RTÉ 2 and RTÉ Player. Listen to exclusive national radio commentary on Sunday Sport, RTÉ Radio 1. Highlights on The Sunday Game at 9.30pm on RTÉ 2.